In power delivery, losses are the “cost of doing business.” Movement of power through any device incurs load and no-load losses which can be assessed and minimized but never eliminated. 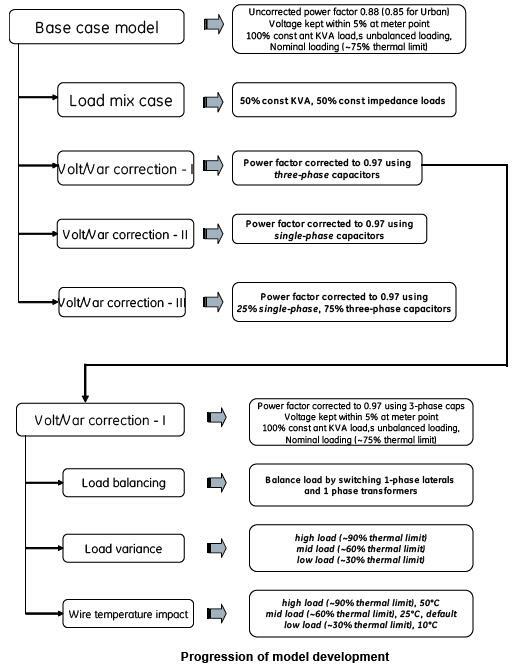 On distribution systems, losses in transformers, primary, secondary and service conductors, and connectors may be reduced by increasing power factor, improving voltage profile, reducing distance to load, and reducing equipment loading. This could be accomplished in a number of ways, but proper equipment selection and sizing is probably the first step. Four feeder models were developed representing typical urban, suburban, semi-rural and rural feeders, which were used as a platform to examine the breakdown of technical losses in distribution systems ... both peak power loss and yearly energy loss. For example, for the base model, the figure below shows the losses at each level of the system as a percent of total losses. 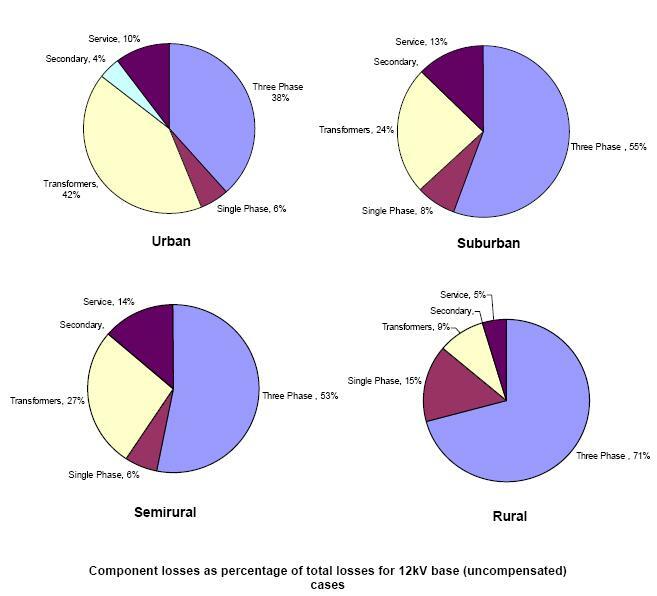 The total losses are significantly higher in the rural case driven primarily by losses on the three-phase feeder. This is not unexpected, due to the typical length of North American rural feeders. Conversely, total losses are the lowest on the urban feeder. Urban systems tend to have much shorter three-phase runs than rural systems. Transformer losses are greater on the urban feeder due to the fact that transformers on this type of feeder tend to be more heavily loaded. The outline for the full report is shown in the figure to the left. A complete understanding of loss breakdown and the distribution of losses on different types of feeders can lead to more effective loss reduction techniques. The DSTAR report examined loss mitigation in the light of the loss analysis and some of the key findings are discussed in this paper. For example, the study has confirmed that if energy conservation is a goal, improving transformer efficiency should be part of the solution. Despite the fact that the US DOE now mandates minimum distribution transformer efficiency, a return to distribution transformer total owning cost evaluation may be more economically efficient than many other investments utilities are currently making to conserve energy and reduce demand. Additionally, where voltage drop and flicker are constraining for transformer application, the greatest efficiency can be realized by specifying the constraint to the transformer manufacturers along with the A and B loss factors. These transformer efficiency measures and several other mitigation techniques regarding primary conductor losses, secondary service design, and demand side management are discussed with reference to the loss analysis results. Distribution utilities can benefit from the indepth analyses and discussions presented in the DSTAR energy efficiency report.